Across the wires earlier this week (AP I think) came the latest in the long line of contradictory studies regarding longevity. This one holds that secrets lie in DNA. “…it’s very hard to get there without some genetic advantages”. How else could there be centenarians who drink like fish and smoke like smokestacks? Made me think of Picasso for a variety of reasons not least because the anniversary of his birth was just a few days ago (October 25) and that he lived to be nearly ninety-two. More to the point, he was conjured into this world on a puff of smoke. Stillborn in Malaga in 1881 the attending physician gave up and gave way to Uncle Ruiz who exhaled cigar smoke into the newborn’s nostrils. You know, great artists look back upon the zeitgeist. 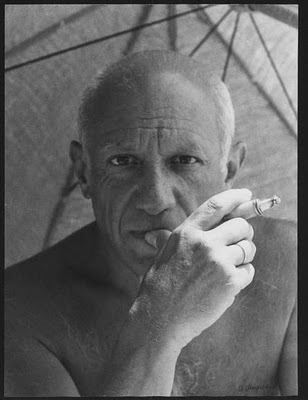 *Story of his birth and the quote came from: Picasso by Norman Mailer. This entry was posted on October 28, 2011 at 8:30 pm and is filed under Art. You can follow any responses to this entry through the RSS 2.0 feed. You can leave a response, or trackback from your own site.